Whoever said April was the cruelest month just hasn't been in Paris for the past 30 days. Not a peep of complaint about the absolutely fabulous weather we've been enjoying. But that doesn't preclude plenty of concern about the possibility of a very hot summer this year. According to news reports not only is this is likely to have been France's warmest April on record, but also there are predictably bad repercussions if the trend continues. "Ce n'est pas normal," the shopped-out ladies are starting to say at the metro station as they fan themselves with a copy of Madame Figaro. In the parks everyone is enjoying the sun and light breezes, but in closer spaces they are fanning themselves to keep cool. Fanning oneself to lower the body temperature is a human activity that has probably existed since those scruffy guys were scribbling on the walls of the Lascaux caves. Maybe even before that, but of course it was much cooler then. In the meantime the French have, naturally, mastered the fine art of fanning. With this warm weather, one fashion accessory that is much in evidence in Paris is the folding fan. Most spots in Paris are not air conditioned, so a fan comes in handy when temperatures rise. Normally I never leave the apartment without my folding umbrella. These days, I don't leave home without my folding fan. I've always loved fans -- so you might say I'm a fan fan. I bought my small pale green little paper fan for 2 euros at a Chinese shop on rue des Archives. Actually at those prices I bought 5 in assorted colors and gave them to friends and houseguests. But as with umbrellas, I imagine I'll be prone to losing fans as well, so I thought it might be good to have an assortment. And better to buy now before the next canicule (heat wave) arrives. When that happens the prices can skyrocket -- even for the cheap ones -- if you can find fans at all. My favorite fans in the affordable price range came from the boutique of the Hotel des Invalides. from 5 euros to 17 euros for pretty printed fans with historic motifs. Presented shut: do you love me? In a bright little boutique on Rue de Rennes yesterday. It has been warm in Paris but the interior of this place was stifling. Why? Because of the preponderance of halogen lights, which make you feel like you're inside an Easy-Bake Oven. Brings new meaning to the term "sweat shop." Ah, why the halogen lights? Bien sur, in France, electricity is very expensive. And halogen lights use less electricity for the candle-watts they put out, if I'm using the right terms. That is why all apartment buildings have minuterie in their hallways: regular incandescent light bulbs on three-minute timers. In France, I think, ever since there has been electricity there has been a notion of thrift with energy consumption. I've always loved the fact that France was naturally "green," in so many ways. Now, right when the planet is warming up too much, it seems as though some places or people in France are just not getting the concept. Back in the Easy-Bake Boutique, we ask the sales girl how she can stand it all day. "Oh, ça va," she says, "we are going to install la clim bientôt." 1. We want to cut down on electrical consumption. 2. We install halogen lighting. 3. This makes our store (or office or home) much hotter. I haven't checked at BHV, but surely Cool Fluorescent light bulbs exist in France? Or maybe I'll check at Monoprix, where the heat from their halogen lighting was driving people out of the main floor in droves. Sometimes life just isn't all that funny. Sometimes you need a little entertainment. Here are a few of my favorite links that keep me smiling or guffawing when there's not enough chocolate in the cupboard. www.dilbertblog.typepad.com Scott Adams's thoughts on just about everything. www.dooce.com Heather Armstrong of Dooce fame. Funny from right down to the kneecaps. Unofficial and official Steve Martin websites. Nuff said. www.thenewyorker.com Just a good all-around resource. www.theonion.com You don't know the Onion yet? www.borowitzreport.com Irreverance at its best. www.improb.com The Annals of Improbable Research, and home to the IgNobel Awards. Makes you laugh and then you think. Plan to spend about 5 days on this site if you've never been there before. A gold mine. http://www.ddbparis.fr/ddb.html French advertising company with many hilarious sketches. MTV and Friskies are among my favorites. http://www.petitsriens.com/bonus.html Stephane Rubin acts out all of those annoying Parisian pet peeves to a perfect art. Chevaucher, in French, means to straddle. Literally to be astride a horse. And that sums me up. Am I a writer or a blogger? Well obviously all bloggers are writers, but not all writers are bloggers. A technician or a wordsmith? These days, it's almost de rigueur to be both. But it's not easy. On the one hand, there is my mother's generation, many of whom are hard-pressed to find the "on" button for the monitor. (Sorry, Mom!) During a recent visit to my mother's retirement community in South Carolina I was told by several of her friends that they finally just gave up on "that computer thing" because it was just getting too complicated. Understandably so. They want to be able to get emails from their children, open photo attachments, and that's about it. And it's become too confusing for them. On the other side is my kids' generation, college-age kids who don't really blog much but speed their way through Facebook and texting, and are completely bilingual in English and Internet. Incapable of explaining what it is they are actually doing, much the way you couldn't explain exactly HOW you are riding your bike while you're doing it. So that leaves mommy-in-the-middle here. Precious few of my contemporaries have blogs. One year ago I had no idea how to write in a blog. Some of you would argue that I still don't, but you may go sit underneath that pigeonnier in the 14th arrondissement. I moved to Paris to experience the ethereal City of Light and now find myself not only caught up in the befuddling world of French paperasse, new systems and so forth, but then when I turn to my comforting link to "home" and my blog, I have a bewildering array of technological terms and techniques that I wasn't prepared to have to learn. I'm soldiering through them, but it takes time and patience, and sometimes cold hard cash. Those lucky, wonderful geeks are not cheap to hire. This will come as a shock to some computer-savvy folks, but many of my friends don't even understand Skype. As a concept. These are smart, college-educated baby boomers who are still grappling with uploading digital camera images instead of getting the prints at the store. They are whiz kids in their own right, but just not about Internet technology. They keep it on a need-to-know basis. We are a generation that still calls our friends when we're in the airport of their home town, even if we are now calling from our cell phones. It's just in the conditioned reflexes. Bloggers see the blogoshpere as the world of the future, yet it is when Petite Anglaise gets her two book deals -- printed-on-paper books -- that we all sigh with envy. So I may be straddling two worlds, but we all are to a certain extent. Look, I may need reading glasses to write my pathetic little blog, but many of my friends think that I am amazingly technically with it. I am not kidding. They say things like "Oh, I'll have to read your website. What's your call name?" Oh, that Polly, she's so adventurous, so daring. She's got a blog! Then in the blogosphere world, I am a Luddite, an anachronism living life in the breakdown lane. I limp along with poor graphics and a font which I detest. I just learned how to add a little HTML. I didn't know that the "Edit me!" things on the sidebar were actually supposed to be edited. It's like life without your reading glasses. Everything looks equally undecipherable. Touching it could mean the blog equivalent of a core melt-down, so I just leave it be. Thank god I found http://www.blogossary.com/, which at least helped me understand a few more terms. I wasn't born yesterday, but yesterday I did discover http://www.dooce.com/ . Bowl me over that Dooce is a real person. A very very funny person. I thought it was just another blog term. Writer's information. I happen to write my blog posts in my Yahoo mail account, so that the drafts are always available no matter which computer I'm on. Then I cut and paste to my Blogspot account. I just spellchecked this piece and Yahoo mail dictionary doesn't even have the term blogger. It wanted me to change it to logger or flogger. Maybe "flog her" would be better. Ever optimistic, the Mairie de Paris is launching a new "Paris Propre" ad campaign this week, designed to cajole Parisians into keeping their city clean. Using humor instead of draconian threats, the message is designed to be "neither moralizing nor repressive." Its official goal is to recognize and showcase improvement and positive behaviors. Hmmm. Mayor Delanoe's pooper-scooper edict in 2002 apparently has done less than hoped to improve the situation. The 183 euro fine has been largely ignored. Snickered at, perhaps? Pooh-poohed? The "J'aime mon quartier, Je Ramasse" signs have become faded or defaced. I don't know if it's just my quirky powers of observation, but it often seems that Parisian pooches must do some arabesques or pirouettes while they are ... doing numero deux. They seem to plop their masterpieces on some pretty weird spots, like pedestals and flower pots. As if it's their special chef-d'oeuvre, dying to be on exhibition. Well, I guess if you're a dog, that is about your only artistic work. Quand meme... And their proud owners are just too enamored to get rid of their darlings' masterful creations. But so many! According to the Mairie, some 150,000 Parisian Fidos deposit about 16 tons of crottes de chiens on the sidewalks annually. That's a lotta lotta poop. We'll see if the talking left shoe really convinces people to clean up after their canine cheris. It's a nice try, but I'm not holding my breath on this one -- except when I walk down the sidewalk. Accent aigu or accent grave? So hard to know, sometimes. And so many French words are so very close. In fact, the word for "close" is près. The word for "fields" is prés. It is confusing. They sound almost the same. But two very different words. Any French student worth his dictée score can tell you that. Suffice it to say that the quartier of St. Germain-des-Prés (St. Germain-in-the-Fields) often has its name misspelled, with the accent grave mistakenly in the place of the aigu. But even at the much heralded Café de Flore? Oh wait -- back to the Flore. So go check it out for yourself. The gorgeous table covers say Café de Flore - Saint-Germain-des-Près. Did anyone else notice? Or is the place just so teeming with tourists that the owners figured no one would pick up on that typo? What about all those intello-literary habitués? This is the hangout where drinking an espresso is supposed to actually make you smarter. It's an institution, for God's sake. I mean, what would Jean-Paul and Simone have said? I hurry out the door and hop into the waiting taxi. "Bonsoir, monsieur, " I greet the driver breathlessly as I plunk in the center of the back seat. "I'd like to go to the American Cathedral, 23 avenue George V, s'il vous plait." The car pulls out and I start making my usual small talk with the chauffeur de taxi. "I hope there's not too much traffic tonight. I'm running late and I have a cancer, " I say in French. The driver dons a worried expression and sits up in his seat. I fret that I have insulted him by saying that I'm in a hurry. I add more to my story. "Yes, and I have friends from the United States who are here to see me. They are here for the cancer. They are waiting at the church for me." Now he's is looking bewildered and almost frightened. He thinks, perhaps, that they are preparing my funeral? A support group? And he's driving me there? "Yes," I add, "and first we are having a rehearsal." Mais ces Americains sont fous, he is thinking as he grips the steering wheel a bit tighter. "And I'm worried because I have a sore throat," I babble. That's the least of your worries at this point, lady, he is saying to himself. Le moindre de vos soucis. "But perhaps it will be better by the time our chorus has its next cancer next week, " I continue. "Oh, un concert, madame!" He exhales the world's largest sigh and sinks back into his seat as we drive silently through the dark together. A Parisian hostess just sent out the following directions to a gathering at her apartment. What struck me was that this is so normal for denizens of our fair city. (Names changed to protect the beleaguered. ) This is just to get in the door. Enter courtyard, bear left. Under the arch there is an interphone with a list of names. Ring Doe and I will buzz you in. Then... go back into main courtyard where you came in and enter the big door with the 'escalier d'honneur'. Enter and walk past the escalier d'honneur (on your right) down to the end of the back hall where there is an elevator. It will come down automatically to pick you up. Press 4e etage and you will have arrived! If you get lost go back to interphone and tell me and I come down and get you. It sounds terribly complicated but is not really so!" Tonight I went to the Théâtre Edouard VII to see the current production of Idée Fixe by Paul Valéry (1871-1945), a former member of the Académie Française. The play had received rave reviews from the press, and was also a heartwarming performance. Somehow I haven't been up for a melodrama; enough of my own to cope with. This was a perfect choice. So Chu came in from the 'burbs and we had a gals' night out and went to the theatre. Great theatre. This was not mere entertainment; this was art. Superbly acted, powerful but simple decor. In the best French style, a moving 2-hour intellectual dialogue between the only two dramatis personae. Begins at sunrise, ends at sunset. As such conversations can go, the topics covered ran the gamut from gynecologists' after-hours activities to Einstein's theory of relativity. And this play was written back when Einstein was lecturing live. (I love the difference in pronunciation: in French it's pronounced Ein-shtein.) By the time the play was over you felt as though you'd spent a day with these two men and lived a great philosophical moment with them. And I'm sure glad that it was all of those lofty things because initially I mostly went to get a real-live glimpse of heartthrob Pierre Arditi. One of my favorite laugh-out-loud French books, by Luis d'Antin van Rooten, is Mots d'Heures: Gousses, Rames. This delightful, funny collection of Mother Goose Stories needs to be read aloud. Several times, until you get it. Here's a sample. It's not just for kids! (Actually not much for kiddos at all.) So uncork a bottle of wine with friends and share. The rules: please read it in your best French accent, and don't seek meaning. It is available at www.amazon.com , which amazingly has the title misspelled. I hate to be so nit-picky. We all make mistakes. Typos are not such a big deal, fundamentally, right? So why does it bother me so much? Perhaps it's because the location was so splendid, so perfect in its own right. The day was perfect, the way Paris has been lately. Crystal blue skies, embracing sunshine, delirious blossoms. Intoxicating, seductive Paris. The building's lofty beauty was jaw-dropping. The exhibit masterful. The crowd almost non-existent, which allowed for close-up inspecting of the descriptive signs accompanying the paintings. Said information was very thoughtfully presented in French, Spanish, and English. Sounds perfect, no? And there it was. At the entrance, the introduction to the exhibit. Just one little letter. In very large font. But really, really annoying. "...the artist was invited to America by President Taff..."
Oh, come on. TAFF?? Did no one proofread the signage? It's one thing to have mistakes in personal documents -- but in large typeface for public viewing by thousands? Naturally, once I found the one mistake (and it was consistent in all three languages), I was like a hound on the trail of foxblood. Typos jumped out at me on every bit of signage in the exhibit. "Mary Cassat" instead of "Cassatt". After that I found lots of spelling mistakes, but by then I had lost almost all of my respect for the curator(s) of the show. I was distracted and resentful. Why bother to make an effort if you won't do it right? I wonder, would any French institution ever consider hiring an American proofreader to read over the copy to avoid the truly laughable obvious mistakes? And thus allow visitors to focus on what's important, like the actual exhibit. Oh, by the way. It was the Sargent /Sorolla exhibit at the Petit Palais. Delightful. Otherwise, I mean. 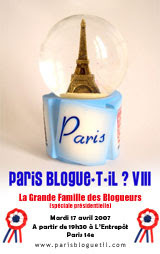 Just back from the Paris Blogue-t-il? www.parisbloguetil.com francophone bloggers' gathering at l'Entrepot in the 14e arrondissement. Lots of fun and some friends from our dear Paris Blog www.theparisblog.com. More on this soon -- but meanwhile: every one can look forward to the time in the not-near-enough future (keep your fingers crossed for next week) when little boomer-blogger moi gets big-time geek lessons and learns the joys of hyperlinks, RSS, html, enabling comments and more. And a new format! Meanwhile, ravie de faire votre connaissance, tous les blogue-t-il folks. A bientot. Yes, I did my taxes. It's tax day, so Uncle Sam beckons. Ergo, just time for a teensy helpful household hint, for what it's worth. Then I'll go back to my moutons. I love the large format posters (100 cm X 150 cm or larger) available at many exhibits in Paris museums and elsewhere in France. Unfortunately they are a pain in terms of storing, shipping in the mail or taking back to the US on a plane. The standard cardboard tubes aren't long enough, which is frustrating. And a wrinkled poster -- well, just don't even think about it. We came up with a good solution when Bee was here visiting in March. Go to the basement of BHV and buy a 150 centimeter tube circulaire made out of PVC. At 11 euros it was cheaper than the fancier tubes up in the papeterie section. Then you can block off the ends as you like. Paper and duct tape, whatever. I imagine this is a bit heavy for mailing (didn't check out that price), but easy to check as a second piece of luggage. Great for storing. Label well so it doesn't inadvertently get used for plumbing repairs. I did it. I finally have a bicycle to ride in Paris. It's been on my to-do list for months, but somehow I just haven't had the nerve. I have been observing, for a year now, those chic Parisiennes who maneuver their way through rush hour traffic, in high heels and stylish skirts. How could they be so oblivious to the dangers around them, I wondered. I envied their bravada. I envied their ability to look so glamorous and put themselves in the spotlight -- sitting so tall and gorgeous astride their velos, being admired by all the men in cars and buses. But I wasn't ready. I needed time to understand the city, to get the flow of life here, to know others who rode their bicycles around. Even then, I just wasn't prepared to make the plunge. Why was I being so cautious? I wondered where I could I keep it. I asked my gardienne if I, too, would be allowed to park a bike in the courtyard, where there are already four in permanent residence. "Mais bien sur," she replied, "comme tous les autres locataires." Of course I had the same rights as the other tenants. Why was I being so anxious? Despite my happy-go-lucky exterior, I clearly am not as adventurous as I might appear. Part of it was that I had heard how often bikes are stolen here. Or parts of bikes. Still, that's not a huge deal. Also I had seen how close the bus or other cars pass next to the cyclistes. The cyclistes don't flinch. Was I ready for a game of chicken? I also had heard from my friend Vincent that he had once gotten a ticket from the gendarmes for running a red light on his bicycle in Paris on a Sunday in August. August! A 300 euro fine, and they would take away his automobile driver's license if he didn't pay it. That story was scary, but I was hanging onto it simply for justifying my procrastination about getting a bike. I had written about Mayor Delanoe's new Velib program, where bikes will be available for daily rental next to nothing, starting this summer. Maybe I should wait and just rent a bike, to see how it goes. Oh, come on. I was stalling, and not happy with myself for doing so. Then Saturday I was heading home from Montmartre on the 12 Metro line and when we reached the Madeleine stop I knew it was now or never. I jumped off and prayed that Decathlon was still open. 19h30 and the store was open til 20h00. This is it. I went straight to the bike section, which I had been perusing for months. To my surprise I beheld what looked like a bike parade. Dozens of people riding bikes in the aisles, examining accessories, discussing with the bike techs their various options. The fabulous staff were jovial and actually laughing, because it was such a madhouse. "How many bikes have you sold today?" I asked. "C'est incroyable!" But they were young, energetic and helpful, and cooperative with each other. A real travail d'equipe. Thierry (forgive me if I got your name wrong) was tremendously patient despite clearly having had a very very long day, eager to begin his Saturday evening. He recommended all the right locks. "This you attach to something tres solide," he warned, about the heavy-duty lock. "Then this cable you attach permanently to your seat (selle). The third lock is to attach to your front wheel, when you are parked for a long time. Les voleurs like to steal front wheels." He showed me how to shift the gears (it's a 7-speed), and other features my Decathlon City bike. It has a panier that removes in a click, a headlight that runs on a dynamo instead of a battery, and I learned the word for kick-stand, which is "la bequille" -- same as the word for "crutch". Then he sent me along to the caisse and it was a done deal. Suddenly I felt kind of the way I had felt 20 years ago when taking my first newborn home from the hospital. "You mean they're letting me leave here with this without any further instruction or permission?" And off I went. After carrying my bike up the stairs to the place de la Madeleine, I climbed on and started pedaling down the cobblestones of rue Royale, in Paris traffic. Me? Me. A feeling of sheer exhilaration perfectly blended with blinding panic radiated from every pore. 'This is so cool!" I shouted to myself, "I can't believe I'm finally doing this!" as I reached the mayhem of place de la Concorde. I was so happy. I felt so free. So much a part of Paris. The wind flowing through my hair. Complete bliss, while gripping those handlebars with white-knuckled fear. I found a bike path (piste cyclable) and flew down the streets, and over the bridge. Watch out, Paris. This crazy American lady has started singing while riding her bike. Somewhere near les Invalides I spontaneuosly began belting out "I have con-fi-dence in confidence a-lone!" a la Julie Andrews. Stay tuned. April in Paris is such a cliche. But what a great one. Today Paris was sublime, although really more like August: almost too hot to stand in the sun while waiting for the No. 69 bus. That glorious bus route is one of my favorites, mostly because you see so many different parts of Paris, lots of monuments and the Seine. It starts at the Eiffel Tower and winds up at Gambetta (where I was headed for lunch), next to Pere Lachaise. For 1.4 euros it's hands down one of the top sightseeing bargains in the City. And today's sights included the lilacs and spirea softly bursting into bloom in the parks. So imagine my reaction when a whiny 7-year-old American mini-tourist was drooping upside down and backwards over the seat in front of me, complaining with the classic "Are we there yet?" to his mother. I wanted to straighten his little t-shirted shoulders and say, "Yes, we ARE there yet, junior -- we're in Paris. Look out the window!" But as the mother of a former 7-year-old boy, I knew better. I leaned over and said in a stage whisper, "You know, a really good trick while riding the bus or walking in Paris is to see how many lions you can count." OK, I have to pat myself on the back for that gem because immediately he and his older sister and their father were sitting up tall in their seats, craning their necks to find stone lions. "There are 4!!" they shouted at the Hotel de Ville. So until they got off the bus they were busy and happy campers. Funny, I would have thought the parents might have nodded a knowing little "thank you" in my direction as they departed. But no. Oh well. I don't need the adulation, but appreciation is ... appreciated. After all, I not only was inventive but I also offered a helpful age-appropriate and instructive activity for the little whiner's scavenger hunt, on the spur of the moment. I mean, there are other sculpture and bas-relief objects to search for on building facades and statues. Gargoyles or rams or fleur de lys and so forth. But also more PG-13-rated sculpted figures, like naked ladies. Of course I didn't suggest that theme to the little kid. Those folks are Americans. Nor, obviously, did I recommend another favorite, immortalized in a witty coffee-table book, Les Zizis de Paris, by Sergio-Neptunio Martin. Correct me if I'm wrong, but I don't think there are many classical zizis on statues that are in the public view in the US. Ah, Paris. No fig leaves here -- just April leaves. And how. Are you feeling anxious about the upcoming French presidential elections? Do the shifting sands of statistics and polls have you worried? Are you concerned that 42% of French voters are still undecided? Take matters into your own hands and decide the presidency in the comfort of your own abode. Like a combination of two of my favorite games (Pacman and dysfunctional family bingo), this jeu presidentiel will keep you from fretting about anything substantial. Of course, if you want to do that, just watch CNN or Fox. But you knew that. Merci to Isa for sending this my way. During my summers as a kid in Tennessee we used to go over to my cousins' house and play with Aunt Betty's Vibrabelt. (Ahem, you wise guys: it's not that kind of vibrating thingy. Get your minds out of the gutter.) It was one of those contraptions for spot-reducing that, as its name suggests, had a vibrating belt that you looped around your derriere and let it shimmy away the fat. In theory. We cousins mostly goofed around and set it on high to make our voices jiggle when we talked as we leaned our backsides into the wide shivering belt. Far from slimming myself in those chubby pre-teen days, the only result I noticed was a sudden urge to pee. Aunt Betty, on the other hand, was a true Vibrabelt devotee. I can see her now, hair perfectly coiffed, laughing in her luscious throaty Southern drawl and deeply inhaling her Salem menthols while her bum was shimmering away at 100 rpm. Oh, Aunt Betty. She was so glamorous. She had perfect nails and central air conditioning. 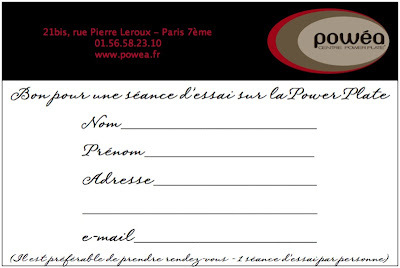 In a Proustian-madeleine-dunking way I conjured up vivid images of Aunt Betty today when I visited the newly opened Powea Power-Plate center http://www.powea.fr/ around the corner from me on rue Pierre Leroux. Power Plate is the buzz to beat all buzz, so tendance with the I-need-instant-fitness crowd. In fact, I'm still buzzing a bit from the experience, but more in a literal sense. Either you know all about Power Plate or you've never heard of it, apparently. I only knew what I had seen in a French chic flick and read in fashion magazines, so I was a wide-eyed novice. Charming, effervescent Regine Petit, the coach who was running the sleek boutique, led me through the motions -- and quelle motions! -- on the big vibrating plate. Regine was delighted to find out I was American and begged to do the session in English. (I used to bristle at such efforts in my naive desire to masquerade as a Parisienne. Now I find I don't mind that sort of request any more -- I know I'll have ample time to practice my impeccable French.) So we swapped vocab while she coached me: you know, technical terms like buttocks and pelvic tilt. I stood on that big plate and held on for dear life while my eyeballs rattled and my thigh muscles really began to burn. And except for the fact that I tend to forget to breathe when exercising (a minor drawback leading to turning beet red) it was a pleasant experience. According to Regine I accomplished 1-1/2 hours of exercise in the 30-minute session. She explained that the machine also helps with stretching, improving circulation and lymphatic drainage, and bone density. My muscles feel as though I just trekked the Himalayas. If Powea's Power-Plate is everything they claim, I'll be as glamorous as Aunt Betty in no time. And maybe more svelte. Free half-hour trial session by filling out this coupon and calling for a reservation. A little riff on the current blogging buzz going around. Type "Boston to Paris" in the space provided. Q. Why do French people think Easter is so great? A. Because Easter -- C'est une Bunny Day! Being called away from Paris unexpectedly has been no laughing matter. 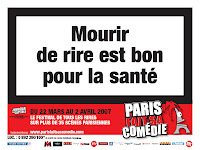 First of all, I had to miss the entire First Annual Parisian Comedy Festival, which ended yesterday and no one even missed me. Second of all, I am resorting to finding daily doses of humor in comparing American life to life in France. It's not always pretty. "I'm Still Hot -- only Now it comes in Flashes"
I think it's time for me to head home to Paris. A few days before I left Paris (it feels like a decade ago but was just une dizaine de jours) I had a rather unsettling experience. It was happy and pleasant, which is what (being Paris) made me feel so odd. Since when did La Poste apologize, in advance, for making us wait? This was positively unfathomable. And she shooed me along with a jovial “A bientot!”. I went on my merry way, shaking my head over the gaiety of it all. I had this unnerving little feeling in my gut. What is happening to the drama of “terrible customer service” that expats love to moan about? What if the French are actually listening to all those complaints and start to become friendly all the time? No, no, I assured myself, this is just an isolated incident. I then entered the pedestrian tunnel to take the Metro at Duroc station, and something looked out of kilter. Peering around, I noticed a bright, open office where the dark ticket window had once existed. The impenetrable hazy glass where often you couldn’t see if the RATP agent was actually there, and if he was you had better ask nicely and only one question at a time, s’il vous plait. And he would shove your tickets and change back through the little mousehole. “Ah, oui,’ she responded, smiling. “No more money here, so no little window. All tickets get bought at the machine,” she gestured. “We are now le service clients.” So the employees at the Metro stations no longer handle any money and are simply there – drumroll please – to be helpful? My unsettling feeling was now growing into a full-fledged conviction. I had just discovered the largest contemporary cultural revolution in France and no one was talking about it. France has become a customer-friendly nation right before our very eyes and nobody realizes it. This is so subversive! I ran through my mental rolodex of recent interactions as a customer. Yes, yes... The waiter in that café asked if I wanted milk with my express (horrors). Now it’s all coming to me -- he was not being snide, he was being F-R-I-E-N-D-L-Y. But what will become of France if this continues? This slight edge, this keeping on your toes, is what constitutes the daily drama in life here in Paris! This is what living here is about – triumphing over the potential displeasure of an agent, a bus driver, a store clerk. Living here well means “getting it” in terms of how to deal with being a customer always at the mercy of the clerk’s or waiter’s mood. As I recited this long plaintive narrative to myself, the metro moved to Invalides, where I had to make a connection.. I thought to myself, I have to get a photo of one of these new friendly “Customer Service” desks. Why didn’t I think to get one at Duroc? At the Invalides station I trudged up the stairs and searched glumly for a dazzling new “Service Clients” window, to snap a photo for posterity.